After successful and inspiring concerts of the ensemble at festivals in Germany, Croatia and Spain, the ensemble was selected by the state of North Rhine-Westphalia to spread its positive energy in India at the culmination of the 2017 season. The group is famous for it’s musical innovation and intercultural projects. In encounters with internationally renowned stars of world, jazz and folk and spiritual music, many first-class and touching pieces are created. The ensemble combines elements from different musical traditions and fascinates its audience with instant composings. 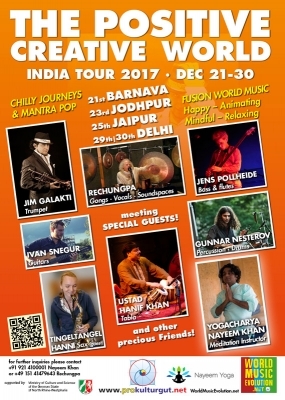 Invited by Indian partners, the Kalashray Foundation and Yogacharya Nayeem Khan, who is organizing the entire tour in India, The Positive Creative World will be performing a charity tour in India at the end of the year and presenting the music of his talented musicians on stages such as Barmer, Jodhpur, Jaipur, and Delhi. In addition to the big concerts, special highlights are musical meetings with regional Indian folk musicians in various villages. Delicate and powerful, invigorating and grooving rhythms · uplifting, touching and enthralling sounds · mantras and sensual lyrics … a genre-transcending fusion of the music of cultures. – For artists and audiences this means: Resonate, refuel your energy, relax, develop ideas and take new impulses into personal everyday life. Intuitive music and instant composings combined with composed elements and associative themes are the speciality of this extraordinary group. The musicians continually explore new, fresh ways of expressing their archaic and modern, acoustic and electronic instruments and find perfection in harmonious interaction. The type and concept of the intercultural fusion ensemble is unique not only in NRW. The artists develop the universal language of music together in alternating compositions and with new musical encounters – each performance becomes a unique experience. Bringing positive energy with music into the world and using it for communication, peace keeping and personal growth is the idea – with joy in playing, common creativity, in touch with the audience.